Will "Eccentric Exercise" Cure You? 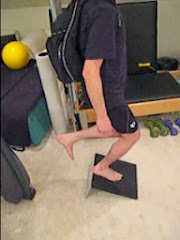 Will "eccentric exercise" cure your chronic patellar tendinitis? -- Even using the ideal protocol for eccentric exercise, one may not be completely cured. However, there are many success stories where people who have had years of patellar tendinitis (also spelled tendonitis or called tendinopathy) have outstanding success after a program of eccentric exercise. It is fast becoming the most accepted form of treatment for chronic patellar tendinitis. -- These exercises put a lot of force on the patellar tendon, so they must be done very carefully over many months. If done improperly, they can lead to a worsening of symptoms. They should be used only for chronic cases, should not be used for inflammatory tendinitis, and should be done only under the recommendation of an appropriate physician. -- Even if you are not completely cured, however, your pain might be reduced substantially and you may be much happier. Your pain may be reduced to such a low extent that it does not bother you much. And, there may be more times of the day when you have no pain, or much less pain. In my case, the exercises have helped me to reduce pain a substantial amount. Now, I rarely have pain. The times I do have some pain, it is substantially more tolerable -- and I am much, much happier. -- In my opinion after reviewing the medical literature and trying a number of different kinds of treatments myself, I believe eccentric exercise is far better than other alternatives. The success rate is generally much better. Furthermore, other kinds of treatments, such as surgery, may lead to irreversible adverse effects. Image #2 -- Injured patellar tendon: disrupted collagen fibers with wavy orientation, fragmentation, and interspersed blood vessels. There is no inflammation present. It is not known how eccentric exercise heals patellar tendinosis or reduces knee pain. Theoretical mechanisms include the possible remodeling of tendon, strengthening of tendon, and the elimination of the small blood vessels that occur in tendons affected by tendinosis.